The above info came from Or Goldreich, and was edited by yours truly (contact me). The image came from World Art. It all began when the first Japanese space shuttle "Lion" blew up before leaving Earth's atmosphere and crashed on the town of Yuiga-Hama. Many people were killed and many more were injured, including Asumi Kamogawa's mother. Five years later, Asumi is now 6 years old and starts school. Her mother dies because of the injuries she got 5 years ago. One day, Asumi meets the ghost Lion-San on the way and helps her carry her mother's ashes to the beach - a place her mother liked. Asumi now wants to become an astronaut. 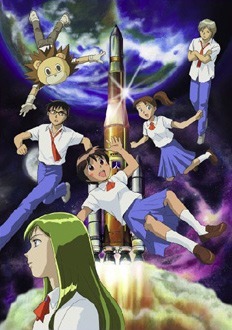 Nine years later, Asumi is now 15 years old and she takes the test to pass into the Japanese space academy in Tokyo. Inside the academy she makes new friends and does her best to become an astronaut. The above description came from Or Goldreich, and was edited by yours truly (contact me).